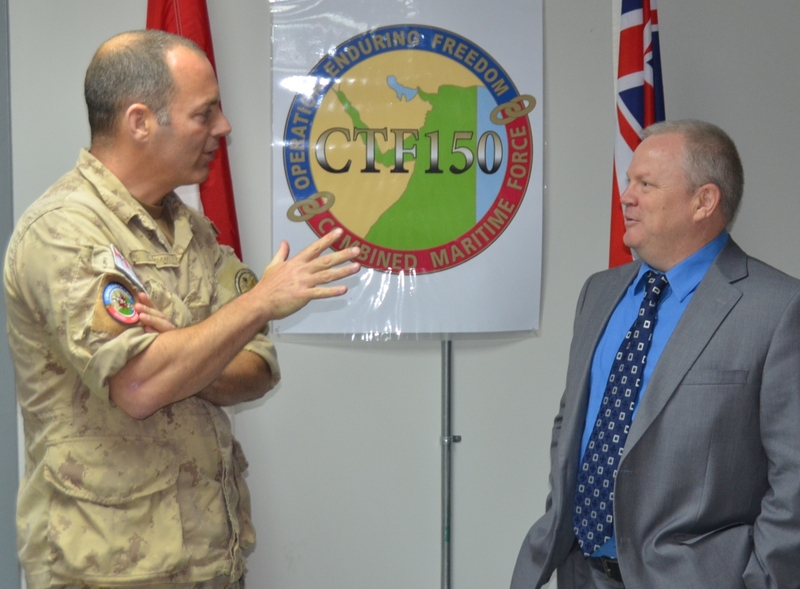 On 4 March 2015, Royal Canadian Mounted Police (RCMP) officials visited Combined Task Force 150 (CTF-150) staff to discuss common challenges and mutual cooperation. Commander CTF-150, Commodore Brian Santarpia, meeting an RCMP representative to discuss mutual cooperation. In executing its mission of deterring and disrupting maritime terrorist-related activity in the Middle East and Western Indian Ocean, CTF-150 regularly meets with regional partners to discuss maritime security interests and the establishment of a meaningful mutually beneficial relationship. This visit of the RCMP complements regular interactions of CTF-150 with other law enforcement agencies operating in the region. Over the past year, Combined Maritime Forces (CMF) has established a growing and meaningful relationship with the US Naval Criminal Investigative Service, the UK National Crime Agency and the Australian Federal Police through the establishment of a Regional Narcotics Interagency Fusion Cell. This relationship has been critical to developing CTF-150 understanding of the threat, information flow across authorised agencies and even the task force procedures when boarding, searching and potentially seizing narcotics.